Coxhoe Parish Council is working in partnership with the Police and Durham County Council to try and overcome issues of highway concern raised by the community. Informal proposals to introduce ‘restricted bays’ (limited waiting of Max stay 3hrs) and amend ‘no waiting’ duration from Mon-Fri to Mon-Sat (single yellow lines) shown on this plan on Coronation Terrace. As indicated above these are just informal consultations at the moment. The County Council will undertake formal consultations on any firm proposals in due course. We will advise further should this occur in the future. Following the public meeting that took place in October attended by Parish and County Councillors, local residents and traders, the Parish Council has undertaken a survey to find more residents views on the issues affecting Cornforth Lane. As some of the options arising out of the meeting could significantly impact on residents of the streets along the Lane, the Parish Council consulted residents for views between 10th January and 25th January 2019. Residents along the stretch between the school and the crossroads received a paper questionnaire to complete and return to the Parish Council. It also provided an online option. The survey is now closed. The Parish Council will now be collating and considering the issues with a view to taking the matter up with the Police and Durham County Council who are authorities who have the powers to address the issues, and importantly need evidence to address them. r any issue, option or otherwise by asking these questions at this stage. The survey is only to seek your views on some of the options suggested solely to understand it can fully understand as many opinions as possible. Due to the numbers of people using the service buses, it is not possible to re-route them away from Cornforth Lane. It is also not possible to introduce residents only parking restrictions to deal with school traffic issues. You are asked to supply your name and address in completing the survey, as we expect to get differing views on issues from different parts of the Lane. Your responses will be treated in confidence and not be attributable to you, however, it may be helpful to contact you for further details on your responses. 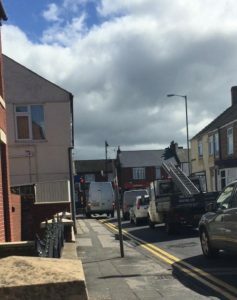 At the traffic light end of Cornforth Lane, Coxhoe Parish Council undertook a consultation in 2015 with residents of Sanderson St and the Co-Operative Terrace opposite on changes to the parking restrictions there. 79% of respondents favoured the Parish Council’s proposals, but this is hardly surprising since they suggested it. Durham County Council officers were hesitant to proceed with this when it was originally proposed because they perceive residents would object. That is why Coxhoe Parish Council undertook the consultation. The Parish Council sent the responses to DCC on 1 May. The response the Parish Council got was that the officer had left the authority and therefore the scheme would have to await another officer being appointed. It was therefore very disappointing that DCC has repainted the parking restrictions this week as they originally proposed. The Parish Council will continue to pursue this with DCC. At a PACT (Police and Communities Together) meeting in summer 2014 Coxhoe residents expressed their frustration and concerns regarding the volume of traffic using Cornforth Lane and daily abuse of the ‘No Entry’ traffic regulations. They called for the road to become a ‘No through Road’. Service Buses and School Buses currently legitimately use this route but many car, minibus and van delivery drivers, even some living in the village flout the no entry signs to the street at speed. This residential street was never designed to withstand the volume of traffic at the speeds they travel and this causes a constant danger to residents and School Children’s safety. This has been an ongoing problem for the Police who receive regular complaints from residents about vehicles driving through the No Entry sign, and whilst they do patrol the area and issue tickets they can’t be there permanently. In winter this road is not designated as a primary road to be gritted even though it’s a service bus route and there’s a school at the end of it. This often results in residents meeting buses, taxis, vans and trucks head on on dangerous icy roads. As a result of these genuine concerns from residents a site meeting was held in July attended by Police, Highways Authority, Parish and County Councillor’s. From this meeting it was suggested we seek permission to close the access road completely to all vehicles at the school end and divert the bus route around the A177 as all other ideas had been looked at and had failed. Whilst in the early stages of the process it was believed that some resistance from bus companies and possibly some residents (who may use the bus stops on Cornforth Lane) may be opposed to such a road closure. Coxhoe Parish Council therefore wanted to hear the views of its community and of any real difficulties that such a closure would cause and if this action would have the support of the majority of residents. A questionnaire was therefore place din the September 2014 edition of the Coxhoe Chronicle. The result of this was that two thirds of residents supported some form of closure. Further meetings were subsequently held with the Police and Durham County Council with a view to providing options at a public meeting. This took place on 18th March 2015. Attending the meeting were Duham County Council Highways Officers Dave Battensby and Brian Buckley, County Councillors: Jan Blakey, Mac Williams and Maria Plews together with Parish Councillors Stuart Dunn, Kay Simpson and Tony . They were joined by 46 local residents. Explore the option of closing entrance to Cornforth Lane from Cornforth and introducing a service bus lay-by on A177 next to school and diverting buses in that direction towards Station Road entrance to village, and only allowing service buses exiting Coxhoe travelling towards Cornforth to go along Cornforth Lane. It was noted that both of these options would require statutory consultation, but the first may take approximately 6 months the second towards a year. The general feeling of the meeting was to support proceeding with the first option ASAP as this fully took on board concerns of public transport users, continually reviewing the effectiveness of this option. There was, however, strong support to continue exploration of and preparation for implementation of the second option in tandem if the first option did not significantly reduce abuse of the ‘No Entry’ restrictions. As a result of the Public Meeting in March 2015 with residents Durham County Council (DCC) went out to consultation on a scheme to help stop the 35,000 cars a year that abuse the no entry restriction at the school end of Cornforth Lane. That was an average of 95 cars per day picked up by sensors installed by DCC. The Parish Council were extremely grateful to Durham Police who stepped up their monitoring of this location and as a result many more are now getting ticketed, after all it is a No Entry restriction! The works were subsequently implemented but in the view of residents and the Parish Council the works were completely ineffective and considered a waste of money. During 2016 the County Council undertook a consultation exercise on proposals for restrictions in Front Street and other areas. Objections were received and the County reconsidered their proposals. On 05 January 2017 Durham County Council made an Order which will come into force on 16 January 2017 which introduces No Waiting At Any Time affecting Sanderson Street, the entrances to Ashbourne Drive, Roslyn Mews, Landsdown Road, and introduces Disabled Only Parking outside Coxhoe Medical Practice and amends restrictions on Co-operative Terrace. Residents raised concerns about the implications of ‘rat running’ around Green Crescent at a Parish Council meeting in winter 2014 following experience during the resurfacing of Coxhoe Front Street. The matter was discussed at subsequent meetings with Durham County Council and Coxhoe Parish Council as well as at the public meeting on 18th March. Highways advised they are in the early stages of looking at Green Crescent so they would gather information from residents at that meeting with regards to problems. The general consensus from public was that since the road works on the front street there has been an increase in traffic through Green Crescent as public now are aware of it. Highways advised they would look into the sign being put back in place. They also advised that if they looked at closing then a full consultation from residents would go ahead with a letter drop to all homes. Professionals advised that there would need to be adverts in the press and legalities looked at. It was suggested that this may take up to 12 months to complete. Durham County Council Highways will report back to Coxhoe Parish Council when they have looked at the possibility of closing all together the route through from the Avenue to the Fish shop. Updates will be provided here when available.